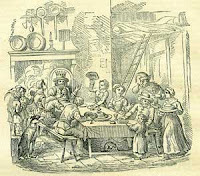 The first engraving, which shows some cooking implements, is from Chamber's The Book of Days, 1869: "The sketch above is copied from an old French print, executed by J. Mariatte, representing Le Roi de la Fève (the King of the Bean) at the moment of his election, and preparing to drink to the company." 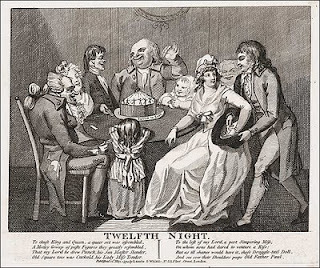 The following image, with the cake, is from the Colonial Williamsburg site: Twelfth Night. 1794 broadside.